Chalk Pad is a free Windows 8 notepad app available under ‘Entertainment’ section of its app store. This notepad app for Windows 8 is quite entertaining tool that stimulates the blackboard and turns your Windows 8 screen into a handheld chalkboard. There are six different colors of chalk using which you can type in your to-dos, draw anything, or use a virtual duster to erase it. As you launch the Windows 8 notepad app, you will come across a blackboard-like screen where you can type in or draw anything you like. At the bottom of that screen, you will find six different virtual chalk along with a duster. At the right side, there are options such as Undo, Redo, Clear, Save, and Setting. Well.. the ‘Setting’ option brings you two different styles of boards – Black & Green. You can easily choose the one you like. Once you are done with your drawing or noting down thing, you can now save it to your Windows 8 machine. Let me quickly point out the main features of this notepad Windows 8 app below. Entertaining tool that stimulates the blackboard and turns your Windows 8 screen into a handheld chalkboard. Comes with six different colors of chalk and a virtual duster. 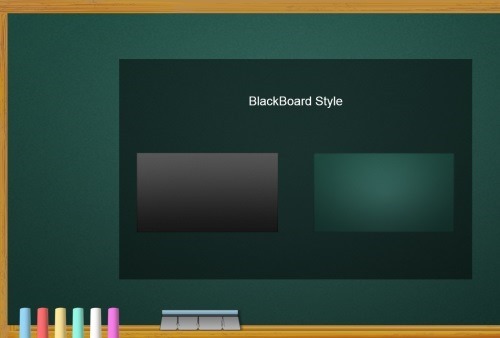 Brings you two different styles of blackboard screen – Black and Green. Lets you Undo or Redo your work. Lets you save it to your local Windows 8 machine. Lets you clear the entire painting in one go using ‘Clear’ button. I did not find this Chalk Pad Windows 8 app much as its very time-consuming to create a to-do list and using those virtual chalk to type in. If you are hands are set and have a good control over mouse, only then it would be easier to type in. Nonetheless, the app is quite entertaining for kids nut definitely not that useful. If you want to give it a try, head over to the app store and check it out under ‘Entertainment’ section. 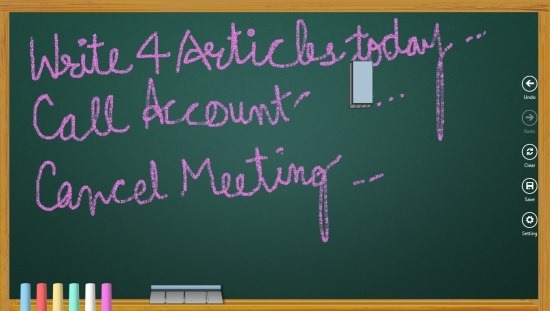 Here is how you easily download Chalk Pad. We have other note pad apps which are quite useful: Work Notes Pro, or also check out Free Replacement for Windows Notepad. Open the given link in IE10 and click ‘View in Windows Store’. You can now proceed with clicking on ‘Install’ button and start using the app instantly. In short, Chalk Pad is definitely an entertaining Windows 8 notepad app where you can draw or type in any thing you want and save it to your local machine. Go ahead and enjoy the whole new experience of virtual blackboard on your Windows 8 screen.